Well, doesn't time fly when your having fun - I don't seem to have had a minute to spare since we touched down in Ripley on Thursday 15th March and that's why it's taken so long for me to find time to write this little episode! However, today is a quiet one so a good time to jot down a bit of a round up of our 2017/2018 retreat in Spain and also to tell you a bit about what we've been up to since we landed! Our 6 hour crossing from Caen to Portsmouth was a doddle with hardly a wave in sight, and with warm sunshine beaming down we were able to stand on the bow deck of our ferry to admire all the views as we rolled into Portsmouth harbour . In all we were away for 105 days and covered 3037 miles, and our plans for a repeat performance are very firmly in place for later this year, however it does seem that we jumped the gun and came home a bit too early cos we didn't miss all the bad weather! We're now parked up on a lovely but very simple Camping and Caravan Club Certified Location just outside Ripley with just a few ducks and pigs for company and this will mostly be home for the next 6 weeks, but so far the weather really hasn't been very kind! When we first arrived (Thursday 15th) it was mostly fine but very cold, but then the snow started on Saturday (17th) and continued throughout the night, so by the time we got up on Sunday morning it was about 4 inches deep and still falling with intermittent blizzards resulting in drifting in places. And as you would imagine, all of the above really isn't very conducive to being parked up on a low hillside with no electric! 🏔🌨⛄☃⛄🌨🏔. However, it has to be said that T4rdis2 coped very well with the adverse conditions, and mostly our diesel heating kept us snug and warm as long as we didn't open any doors or windows that would have allowed Jack frost to nip in! Additionally, me and John just layered up in our thermals and all in all we managed quite well - and now we've had a practice run we'll be well prepared for the next round which seems to be promised for over the Easter period! Anyway, enough of that - I want to tell you about some of what we've been doing with our time since we got home! 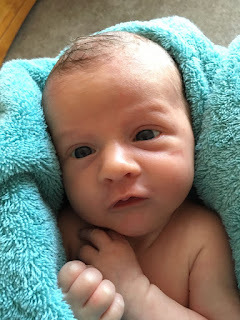 One of the first major events was our introduction to our new little Grandson Max! 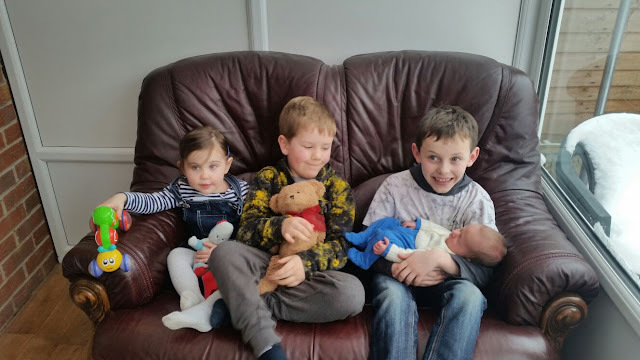 He arrived on 26th February to a very proud Mummy (Vicky) Daddy (Adam) and Big Brother Jack, and that all happened while we were still away so by the time we met him he was already 3 weeks old! However Vicky had kept us very well supplied with pics and news so we almost felt as if we hadn't missed out too much - but it really was a lovely moment to meet him in the flesh! Then on Sunday (18th) we, along with all the rest of our immediate family descended en mass to visit John, Val and Rosie (John's Mum, Sister and Brother in Law), and this proved to be another tear jerking reunion - for some of the girls at least! Monday passed by quickly and was spent collecting our hire car, shopping and visiting my brother Pete, but Tuesday was very entertaining because we had the pleasure of Evelyn's company from about 7.30 in the morning. 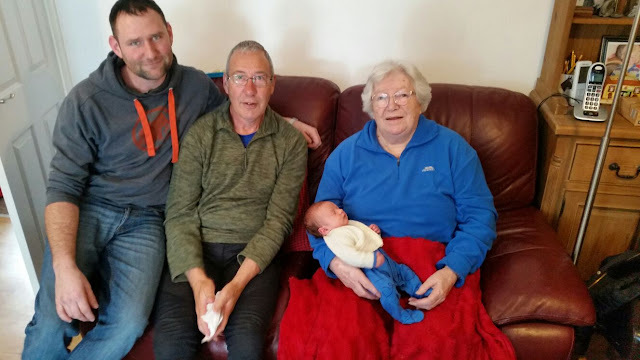 She was delivered to T4rdis2 by Daddy (Ben), and for saying she hadn't had much contact with us for the last 4 months she wasn't really a bit bothered by her strange surrounding! We fed the campsites flock of ducks and visited the 2 pigs (who she suggested should be called Pepper and George) and inbetween that she spent her time decorating T4rdis2 with my little pony stickers and producing play-doh models! The rest of our week has been spent completing mundane tasks like visiting the doctors and dentist, shopping, chatting with friends and of course a couple of family feasts, and tomorrow is booked for a trip to Alton Towers! I'm not sure if I'm still up to huge swirling roller coasters but I bet once I get there I'll give it a go if one of the children will hold my hand! !